Dish Network gave me a free premium channel the other week, and so I watched The Hunger Games: Mockingjay, Part I. Which was a kind of masterpiece, because in a film over two hours long nothing really happened. What’s going on is that the success of the Twilight films, in which the final volume of the trilogy was broken up into two separate films, has created a new paradigm— Two movies! Twice the money! I haven’t read the book on which the film was based, and so I don’t know how closely the action in the movie parallels the action in the book, but in any case practically none of it was necessary action. At the beginning, Katniss has been rescued from the latest iteration of the Hunger Games and brought to the Sekrit Underground Base of the rebels, which is so well-equipped with amazing technology that I was astounded these guys were on the losing side of the last war. 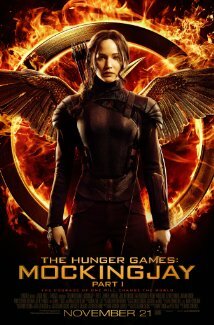 Once safe underground, Katniss faces the same challenge to her integrity that she faced in the first film. In Hunger Games, Katniss had to suppress her genuinely heroic personality in order to become a teevee action star, because being a teevee action star was the only way to inspire the Capitol’s decadent aristos to help her in the Games. In Mockingjay, she finds herself a symbol in a nationwide rebellion against Evil President Snow, and so Possibly-Not-As-Evil rebel President Coin wants her to suppress her genuinely heroic personality and become a star of propaganda videos. Everyone wants Katniss to become a complete phony, and we all know how much teens hate that. And then tension ratchets up, and things get worse for a long time. But while there are lots of incidents, including an actual save-the-cat moment, plus lots of battles and explosions, lots of chances for President Snow to be Evil, lots of pictures of ruins, and many challenges to Katniss’s character, the plot itself doesn’t move. At the end, Katniss is in exactly the same place she was at the start, and so is the rebellion. The only thing that happens is that Peeta is rescued, and that could have been pushed to the next film. The film was a brilliant triumph of incident over plot. If enough things happen, the creators seem to say, the audience won’t notice that nothing changes. I’ve been noticing this a lot lately, especially in the superhero genre. This summer I’ve been watching The Flash, which has excellent production values, an attractive young cast, and a whole lot of well-done soap opera. But most of the episodes feature a plot with a lot of vamping. And the reason is that the Flash’s super-speed, if treated honestly, will solve just about every problem in, well, the blink of an eye. He can run just short of the speed of sound, say 700mph, and that means that he can grab every villain in Central City, disarm them, drop each in his very own cell, and pick up all the bubble gum from the streets, all in the amount of time it takes me to walk from my easy chair to the refrigerator. So in every episode, the Flash has to stop to talk to the villains, or do some other stupid dang thing, so that the villains can defeat him or put him in jeopardy or shoot him with their freeze ray. The action is a complete stall until the climactic scene, when the Flash remembers— Hey, I’ve got super-speed!— and then he whisks the villains off to justice. For instance, when confronted by a nearly invulnerable super-bruiser, the Flash tries to fight him with his fists, so of course the super-bruiser whomps the tar out of him. (Fortunately the Flash also has super-healing.) 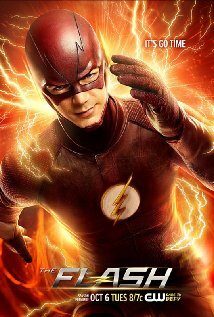 What the Flash needed to do was not accelerate his fists, but objects. A small lead ball accelerated to 700mph becomes a bullet, and it is deadly. A six-pound cannonball accelerated to 700mph will punch a hole in a wall. A titanium rod accelerated to 700mph can punch through a tank. In a recent episode, the Flash was trapped in an office building by a swarm of bees. (Bees? Seriously?) All the dude needed was a flyswatter or a rolled-up newspaper– flappity-flappity, and the bees are all dead. Or he could have clapped his hands and knocked them from the sky with the sonic boom. Or any number of things. Amazingly enough in a series with a cast composed mainly of scientists, nobody thinks of Newton’s Second Law: f=ma. Reading a lot of recent fiction, I’ve noticed a great many books in which the middle third exists only for the purpose of postponing the finale. If you’re a writer, you should aspire to more than that. Don’t just throw in meaningless incidents, or create phony dilemmas. Reveal character! Create subplots that resonate with the main plot! Create characters whose problems reflect on those of the protagonist! Catch the antagonist in a revealing moment! There’s a lot you can do. Go forth, O Writer, and do it. As someone who read the novels, I can tell you that on the surface the movies hew close to the novels plot-wise, but it’s missing some crucial details and some of the message is lost since we can’t hear Kaniss’s thoughts. First of all, District 13: this used to be the Capitol’s nuclear munitions production facility before the last failed rebellion. The Capitol was fully aware of them this whole time, but they can’t do anything since their arsenal could vaporize the Capitol. In the beginning of book three it is also explained that they much reduced in numbers and nearly wiped out before they received an influx of refugees from the bombed District 12. Now, about Katniss – the point of the novels is that she’s not an active hero character. The point of the novels is that she’s being used, and can only act and influence in very specific moments. This is actually what I liked about the novels – it’s unrealistic for a teenager to be a heroic rebel leader (even if she can use a bow), and she isn’t. But it doesn’t make for good action-packed cinema, and when you cut a novel in half remove her inner monologue you’re not left with much of a plot. There was an episode of the animated TV series “Justice League Unlimited” in which Lex Luthor switches bodies with The Flash, and we see how deadly the latter’s powers can be when their user is free of most moral constraints. I cannot remember if Twilight did it first. Harry Potter and some other movie franchises have also split the last film. For TV, it goes back to the Sopranos splitting its last season, leading to Breaking Bad, Mad Men and others doing the same. Michael, I think Katniss is actually quite heroic, as is demonstrated by her loyalty to her friends and her insistence on helping them even when it’s dangerous. She doesn’t =want= to be a hero, but when circumstances demand it, she’s there. She’s not a big flag-waving hero, as in her propaganda vids, but she’s quietly heroic all the same. Harry Potter may well have done it first, but then it was splitting up an enormous 800-page novel, for all that much of it was taken up with excruciatingly dull scenes of camping. Mockingjay is, I think, much more modestly sized. Just checking – did you manage to recover those files, or should I get back to work? You know, I’ll have to check myself. I’ll get right back to you. Where will it all end? Someone making three full-length movies out of one children’s book? Nah, that would just be too silly. TRX— hey, I got the clean files! Thanks for your heroic efforts, though, and your offer to try again.